March Madness refers to the single elimination tournament for NCAA Division1 basketball. The event is extremely popular as CBS Sports and Turner Broadcasting System Inc., paid more than 10.8 billion dollars for the rights to present the Division I Men’s Basketball Championship beginning in 2011 through 2024. The games are aired on CBS, TBS, TNT and truTV Networks. •	Get alerts about upsets, close games and more. •	My Channels: Find out where the games are on TV in your area. The tournament is now also using Twitter to increase the interaction for this event. “Twitter is bringing March Madness to the mobile masses”. Viewers can tweet throughout watching the games, and without leaving twitter, they will have the opportunity to watch highlights and replays from a live game. In a world that is becoming more mobile every day, social media networking is growing. People now urge to Tweet there every thought, upload pictures of themselves or their meals via Instagram, and share videos with the world on Youtube. One of the newest application cravings is for SnapChat. SnapChat is a free mobile application that allows users to share pictures, for a limited time period (10 seconds at the longest) before the pictures are deleted. I.E. a new flawless applicant for sexting right? Wrong! When marketing one of the most important factors is to know your target. Social media is a popular means by which to advertise in society today and in the near future, however if marketers do not use outlets that are popular within their target audience, the advantage of using social media will be lost. By understanding where your target audience spends the majority of their time, companies can decide where to allocate the most of their advertising dollars. According to Nielsen and NM Incite’s latest Social Media Report, consumers continue to spend more time on social networks than on any other category of sites—roughly 20 percent of their total time online via personal computer (PC), and 30 percent of total time online via mobile. Additionally, total time spent on social media in the U.S. across PCs and mobile devices increased 37 percent to 121 billion minutes in July 2012, compared to 88 billion in July 2011. In order for company’s to continue to take advantage of marketing through the social media trend, the must completely understand where and how to reach their target market. Making advertisements tailored specifically to this group, through the medium used. From a marketer’s standpoint, mobile marketing is ideal. Marketers can now tailor their advertisements to consumers based on Search Engine Optimization , or geo-location, providing more accuracy and more intimacy than typical mass marketing. However to a consumer Mobile marketing has become a nightmare. Smart Phones now are able to do more than ever: widgets such as Siri, are able to vocally answer questions with the help of the internet, Google Maps can provide directions using your ‘current location’, and even Weather updates can be automatically uploaded to a mobile device. In a world that is becoming more mobile privacy is becoming transparent. In a world that has become so centered on technology, brevity and connectivity are vital, and the devolved ability to be connected constantly is now a craving. Because people now have this required need for immediate connection, geolocation marketing is becoming increasingly important. As defined by Google: Geolocation- is the identification of the real-world geographic location of an object, such as a radar, mobile phone or an Internet-connected computer terminal. With companies now having the ability to know exactly where someone is, brands can target their audiences based on location, something that could not be done as immediately or on the go, through more traditional marketing methods. Foursquare is a location-based social networking website for mobile devices. Users cheek in at places using a mobile website, from list of places or venues the application locates in the area. Each ‘check-in’ brings the user points and sometimes what the company calls badges. Points and badges, are collected until the user gains a rewards from that specific location. Foursquare has acquired over 750,000 different places or businesses that offer specials or incentives for users to ‘check in’. Foursquare specials are essentially incentives businesses provide to users in order to persuade consumer to become more frequent or even first time users. Once upon a time, businesses only marketed to consumers through direct mail marketing, brochures, television ads, radio advertisements, and other more conventional methods of marketing. A time before Pandora radio, before twitter and Facebook, before YouTube was in the palm of our hands, before the world became so mobile, imagine that! Today conventional marketing has all but become a thing of the past. Everything is fast. If it can’t be done on the go, people either do not want it, nor have time for it. 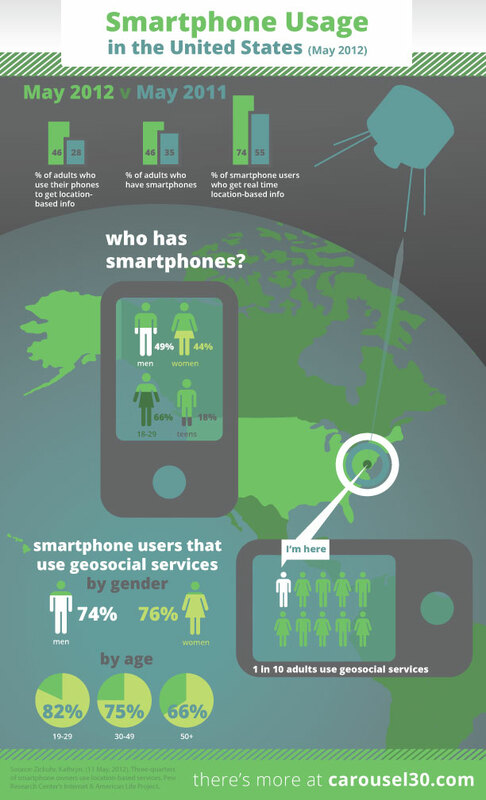 With this being said mobile marketing is booming. By the year 2013, download purchases in mobile application stores will surpass 21 billion. With these numbers marketers now have a broader market than ever to reach their audience. Mobile marketing provides numerous outlets and opportunities for companies and businesses alike to promote and market their brand. Mobile marketing is now. Mobility is the future. Social media is a growing outlet for marketers, with word of mouth marketing being the main driving force behind social media marketing. Social media marketing can take two different paths. Companies can market to consumers on different social networking sites, and/or consumers can create or reiterate content for companies themselves. It is “imperative that you produce products and services so that people not only want to be associated with you brand, but also take ownership of it.” (Qualman, 2011) This allows for consumers to create their own content and become marketers themselves. User to user marketing at times can be more effective as it comes from a trusted source. Companies that can create content for consumers to talk, tweet, blog, or post about, allow their company’s particular message to spread from user to user and third party sources resulting in EARNED media opposed to paid media. Social media is a relatively inexpensive and efficient option for organizations to market themselves, and their new campaigns. Not only does it bring increased brand awareness because of the sheer number of users available on social media sites, but it also increases brand relations as it makes the brand more personable. Social media has essentially become a platform that is easily accessible to anyone with internet access.